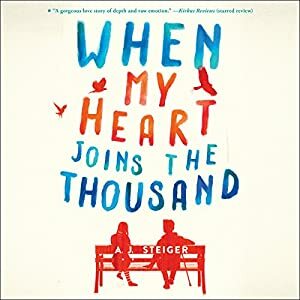 When My Heart Joins the Thousand is a YA novel about a 17 year old girl Alvie Fitz who has Asperger's and has had a very troubled past. She lives on her own, earning a living by working at a local small zoo. She has no friends and no family, so she is very isolated, but it doesn't bother her. She loves animals and in her spare time she reads and learns about science. But she sees a boy at the local park throw away his phone, and she contacts him. She and Stanley get on well, and text a lot. It turns out that he too has no family, and he has many medical problems. He is also a loner, although he goes to college. The story is largely a romance, including some explicit sexual acts. But the path to the romance is very rocky, because Alvie's life is so precarious and she has such a hard time working out how to cope with other people. The book also contains many flashbacks and revelations about the past. We learn about both Alvie's and Stanley's very dysfunctional childhoods, including hospitalizations and foster homes. Some of the strongest parts of the book are the portrayals of the teasing and taunting Alvie is subjected to, including some awful bullying. The authorities blame Alvie when she gets angry and violent in reaction, and so she is the one to get punished. Steiger's book is unusual in frankly portraying the sexual interest and desire of a young woman with Asperger's, and her interest in a romantic relationship despite the difficulty she has with interpreting social cues. Alvie is a charismatic narrator, often funny in her observations and comments, precisely because they are so honest and socially inappropriate. Sometimes the story seems a bit excessive in how bad things were for both of the main characters, with one secret after another gradually revealed, each more dramatic than the last. But it makes the book engaging. Tavia Gilbert's performance of the unabridged audiobook brings out Alvie's energy and emotions, but is relatively restrained, which enhances the power of the story.